This is the title of a small study that sums up my Global City Babel Series about the antithetical war between the words of men (Babel) and the Word of God (The Babe of Bethlehem). 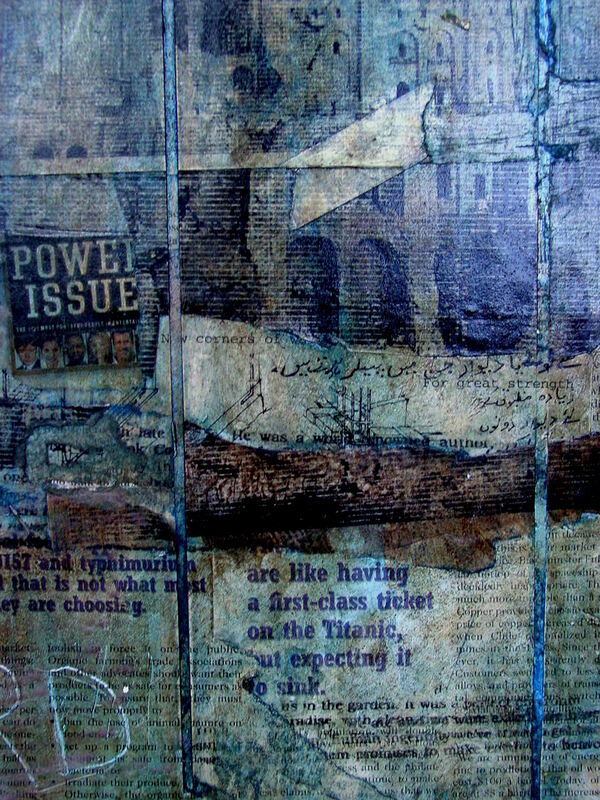 I mentioned following up on this painting in a previous post called Word/Image. 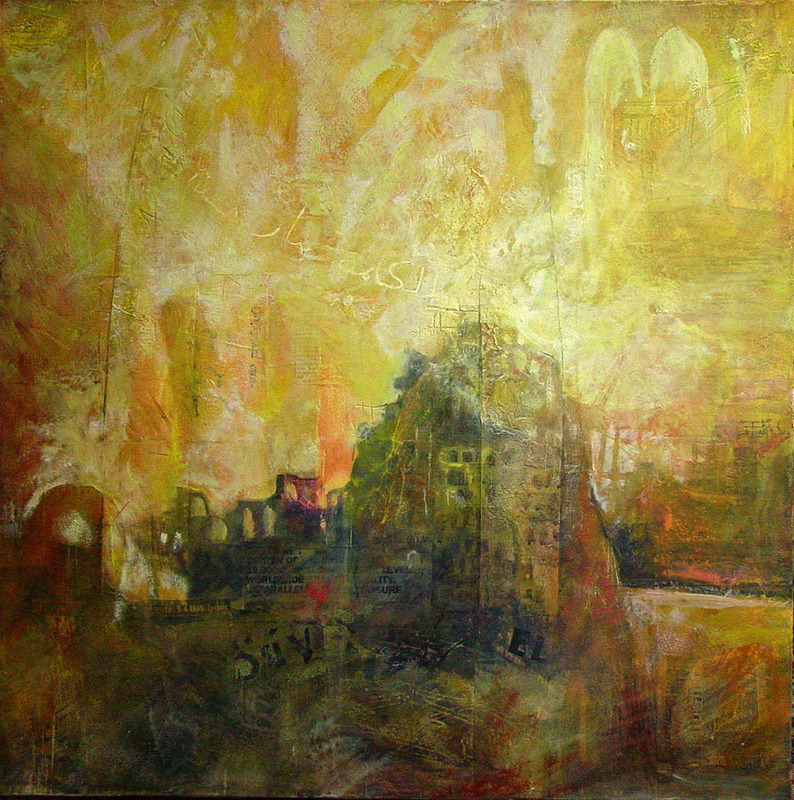 The City of God / The City of Man, 36 x 36 inches mixed media on canvas will be featured on the Fall issue. 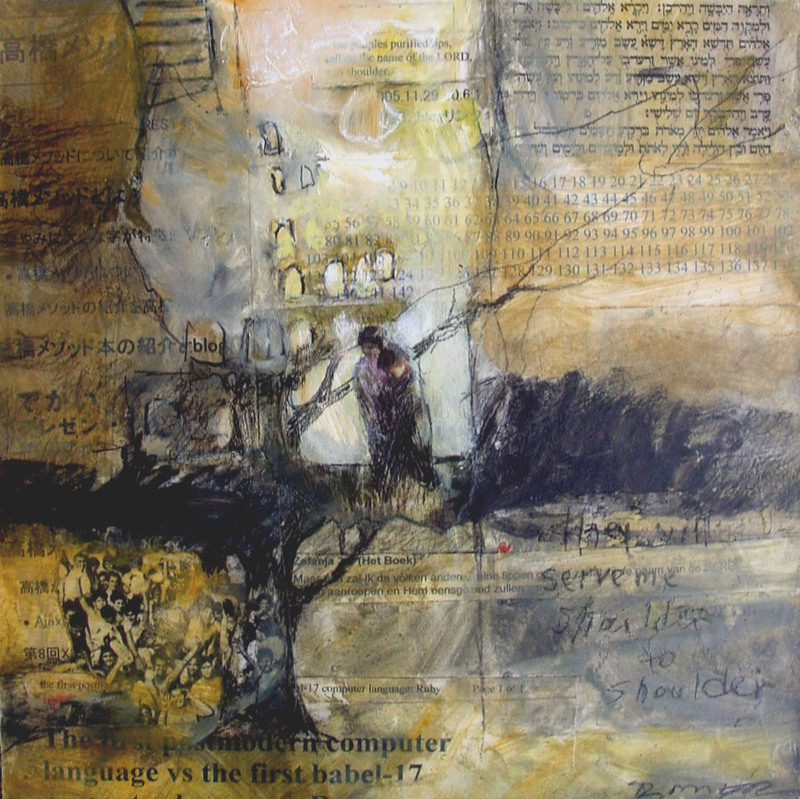 This encaustic mixed media painting, divided into two parts, is also about the antithetical war between Babel and The Babe. The bottom half includes black and white photographs I took in New York City and images of the 1999 war in Kosovo and the Balkans. 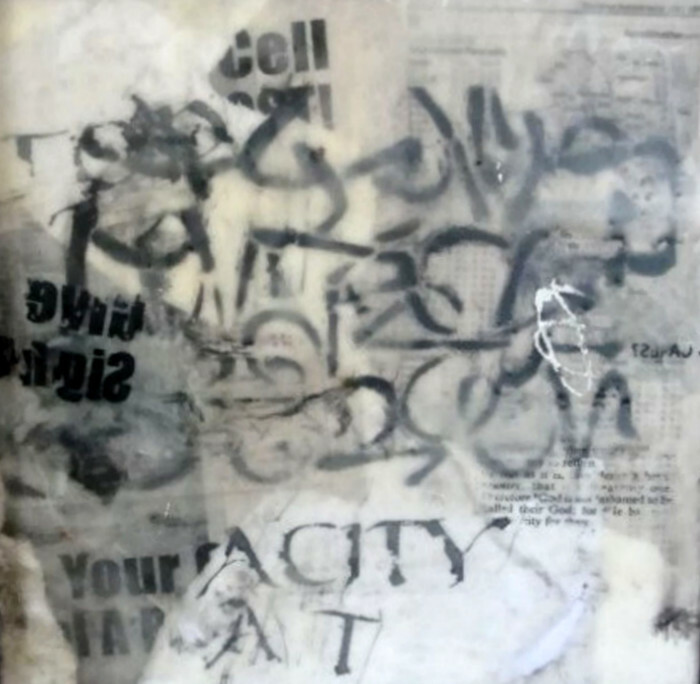 The top half includes church architectural drawings, Arabic text — the Word became flesh descending on the tower, biblical texts and the large text — I AM. It is covered with golden beeswax. The City of God / The City of Man takes its title from Saint Augustine’s book De Civitates Dei, in which he presents human history as being “a conflict between the Earthly City (The City of Man) and the City of God, a conflict that will end in victory for the latter. The City of God is marked by people who realize the transience of the earthly city with its concern for power and pleasures. They dedicate themselves to the eternal truths of God revealed in the Word of God. The Earthly City consists of people who celebrate the pleasures and cares of the present world and who believe the ever-changing words that promote power, peace and comfort on earth. The basic thesis of Augustine’s book is the history of the world as the universal warfare between these two cities and between God and Satan — the theme of my Global City Babel Series. This biblical warfare began when man sinned. God told Satan in the Garden of Eden, “I will put enmity between you and the woman and between your offspring and her offspring; he shall bruise your head and you shall bruise his heel” (Genesis 3:15). This conflict is also summarized in the final prophetic drama of the book of Revelation (The Unveiling). 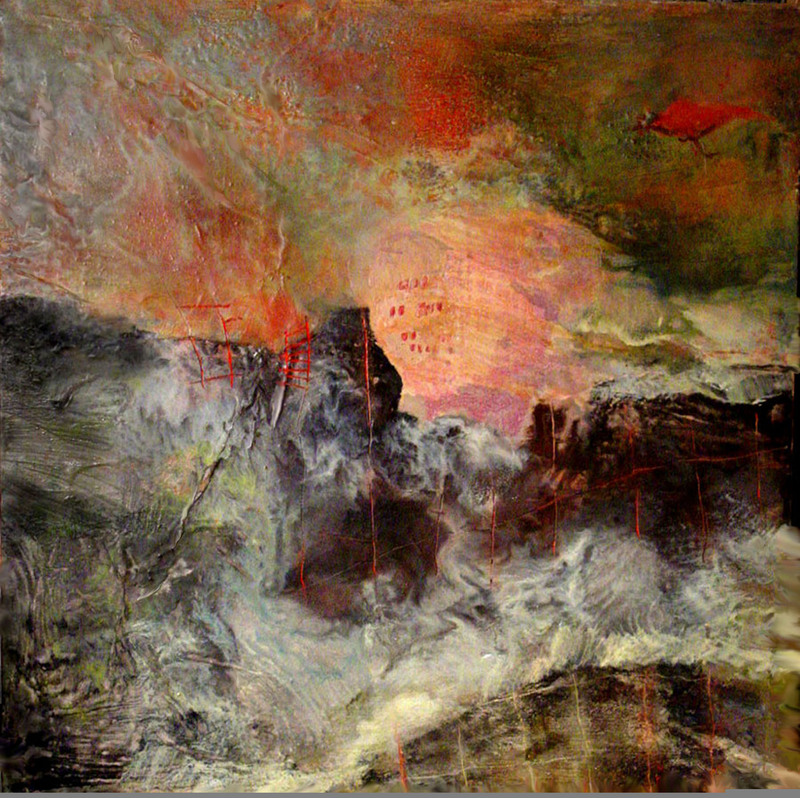 Last week, the painting Foundation/Global City Babel that began this series was purchased by collector Dona Spaan for the Permanent Collection at Calvin College in Grand Rapids, Michigan, a collection that includes artwork by Gerhard Richter and contemporary Dutch photographer Henrik Kerstens (1965). The Tower of Babel (right) by Pieter Bruegel (1563) is my central motif. 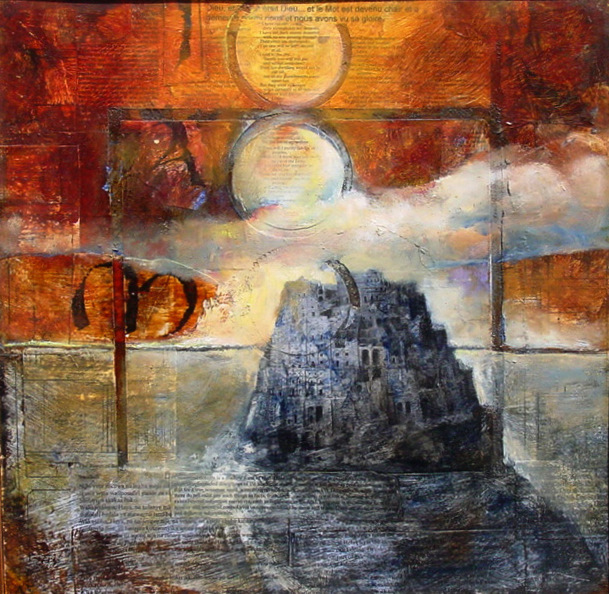 It references the biblical tower (Genesis 11) where God intervened to confound man’s words and his desire “to reach the heavens” and “make a name for himself.” This Dutch artist had a biblical view of reality. His visit to Rome inspired this Babel tower styled after the Roman Coliseum. Christians of his day equated Rome with the Biblical, Babylon the Harlot, the antithesis of the Bride of Christ. Babylon was the seducer of man’s heart. 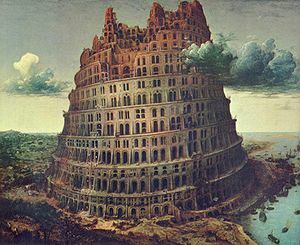 Babel and Babylon symbolized all that is opposed to God’s Word and his glory. The hand-made frame of this painting includes the all-seeing eye of God at top center and small pilgrims in the wood on either side. The incised text is the stylized acronym for the Tanakh or the Hebrew Scriptures. 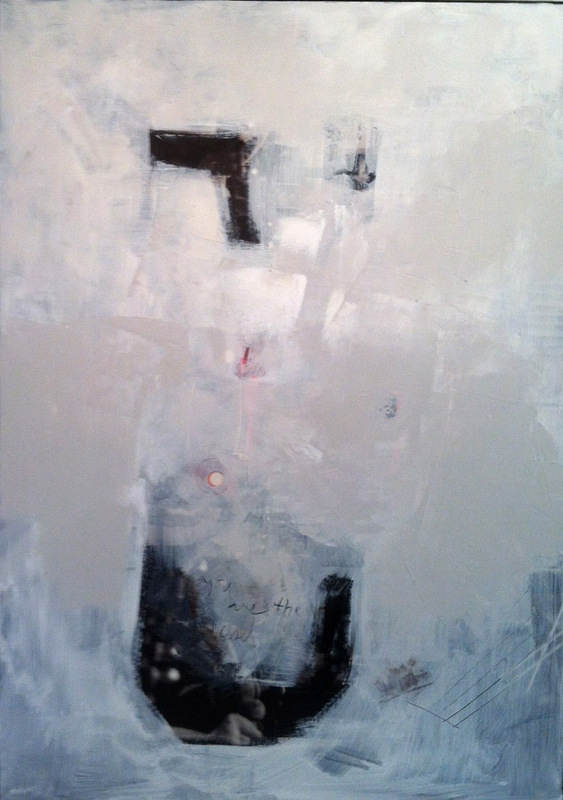 This series describes our postmodern culture where meaning and words are confused and manipulated for power. Breugel’s Tower is an apt symbol 500 years later as this cosmic battle between the seed of the woman and the seed of the serpent is revealed. It will continue until The Word of God, who is Faithful and True, returns to claim his kingdom already won by his sacrificial death. 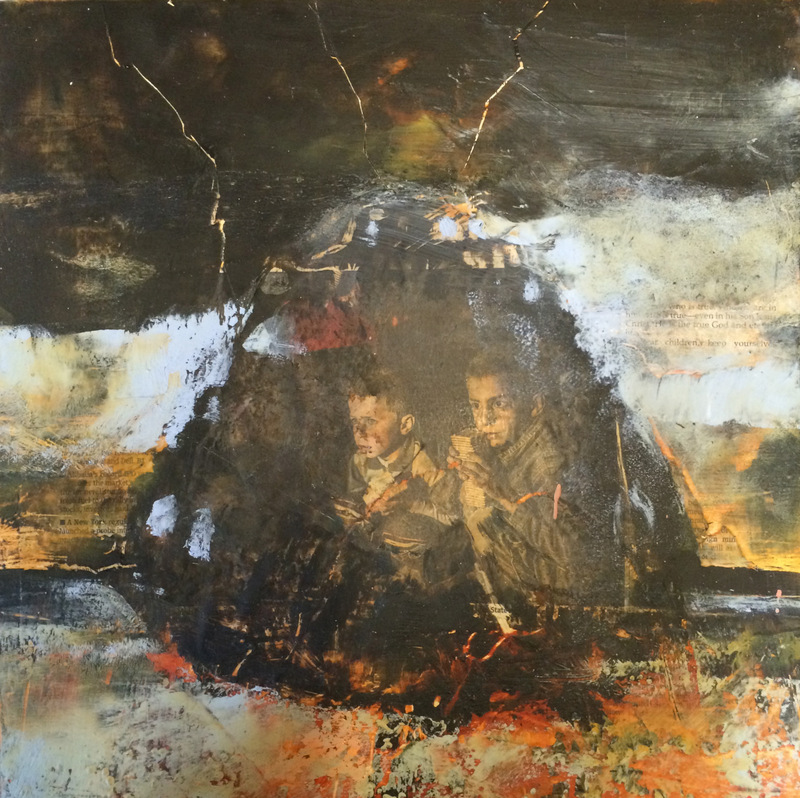 Babel’s Child I (below) is also about this conflict. The figure is bowed with a Babel tower on his back. 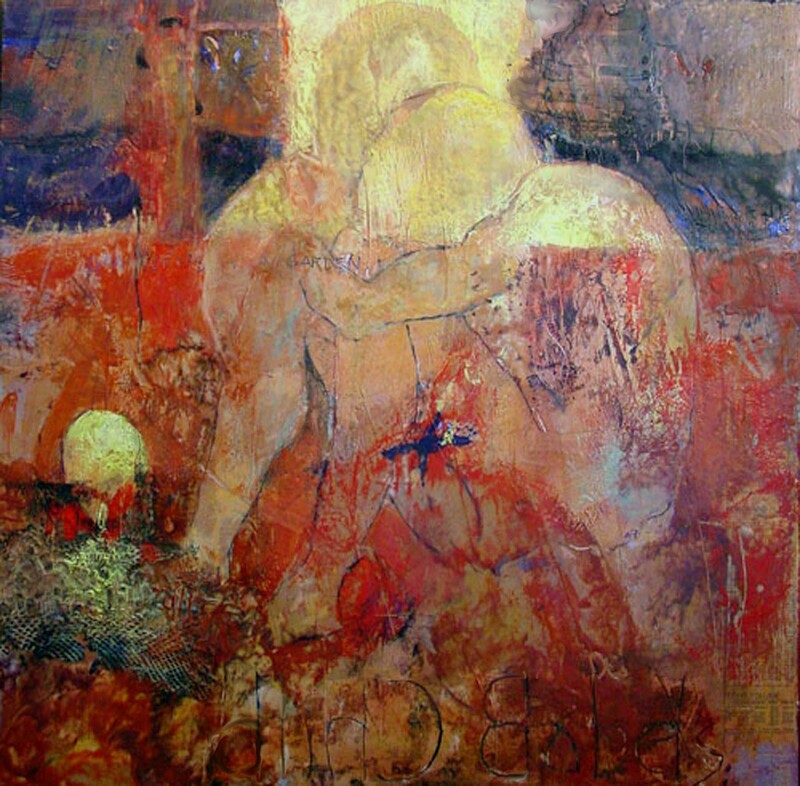 A snake skin, a symbol of The Fall, is embedded in the beeswax at his feet and the sacrificial death of Christ is alluded to by the snake on the pole. In Purified Lips (below) God’s Word descends from the sky. 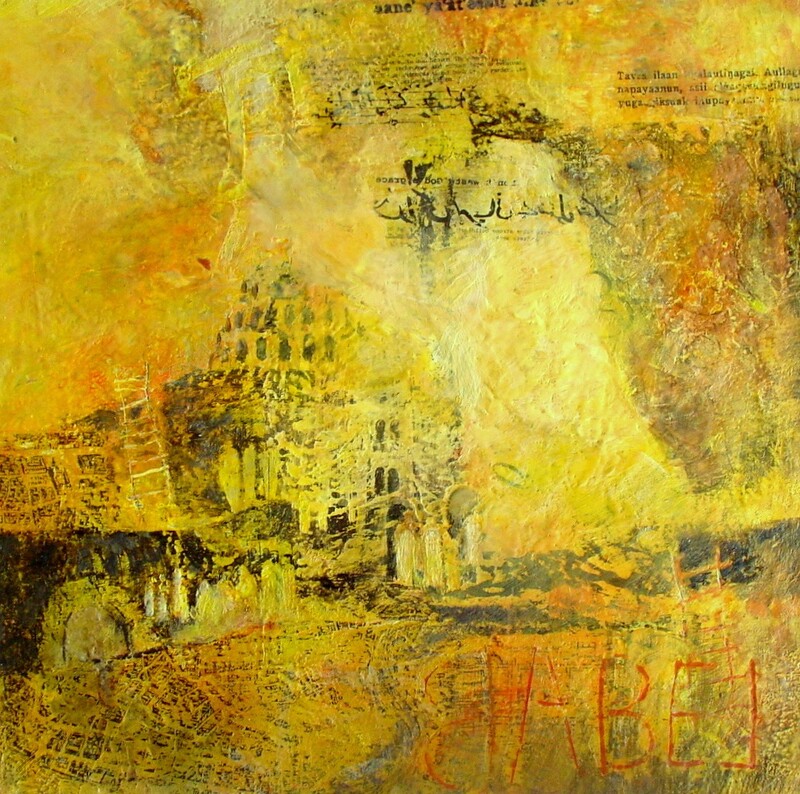 The title is taken from Zephaniah 3:9 — For at that time I will change the speech of the peoples to a pure speech, and all of them may call on the name of the LORD and serve him shoulder to shoulder.The Tower of Babel is situated on deconstructionist texts and city plans, while the text from the sky in the French language is from John 1:1 — In the beginning was the WORD and the Word was with God and the Word was God. 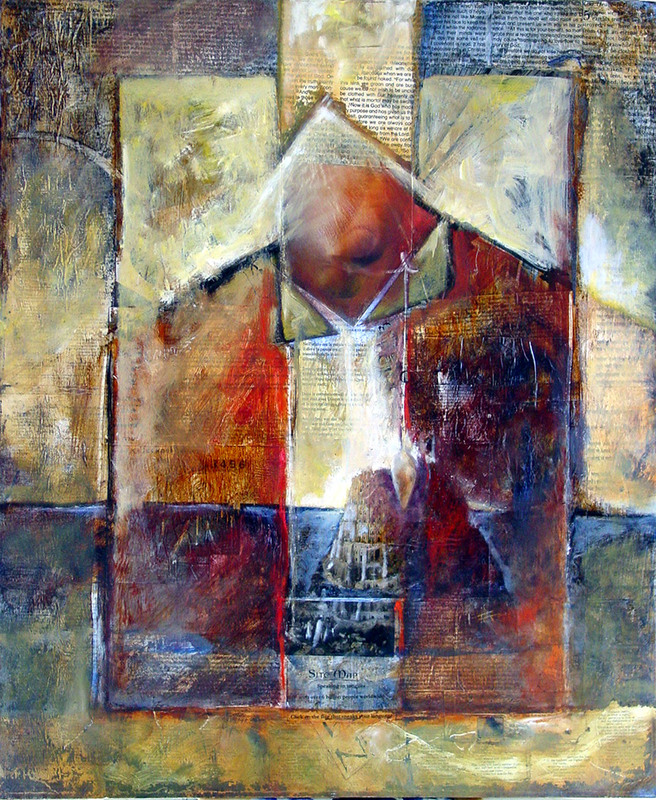 The two paintings above were also inspired by this text from Zephaniah 3:9. In Babel Overturned the Tower of Babel is upside-down in a turning sea. The cross, the means of Satan’s conquest, is referenced by the incised grid of red lines (the Nets of God). As this battle between Babel and the Babe wages, we wait. Until Christ has taken captive all His captives, we are “strangers and aliens on earth,” captives in a foreign land. As C.S. Lewis writes, “We are on the outside of the world, the wrong side of he door. . . . 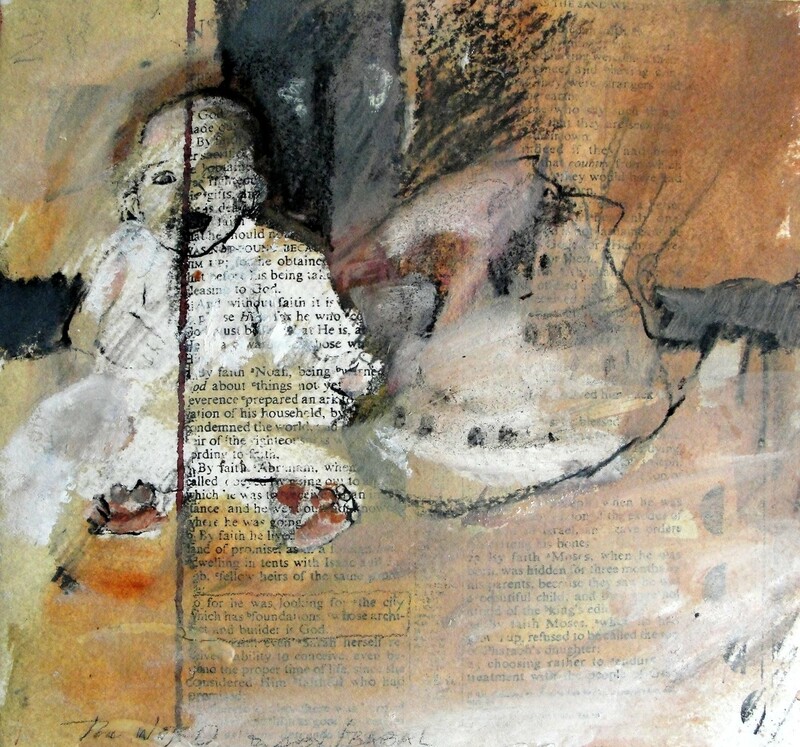 But all the leaves of the New Testament are rustling with the rumour that it will not always be so. Someday, God willing, we shall get in (The Weight of Glory). Finally, two recent paintings on “Ikea photographs” of cities — New York’s Brooklyn Bridge is turned upside-down, the city is burning. It references Revelation 17 about the doom of Babylon, the Great Prostitute (aka the Harlot) — all that is opposed to the Bride of Christ. They (those who follow the Beast) will make her (Babylon the Harlot) desolate and naked and devour her flesh and burn her with fire . . . and the woman that you saw is the great city. 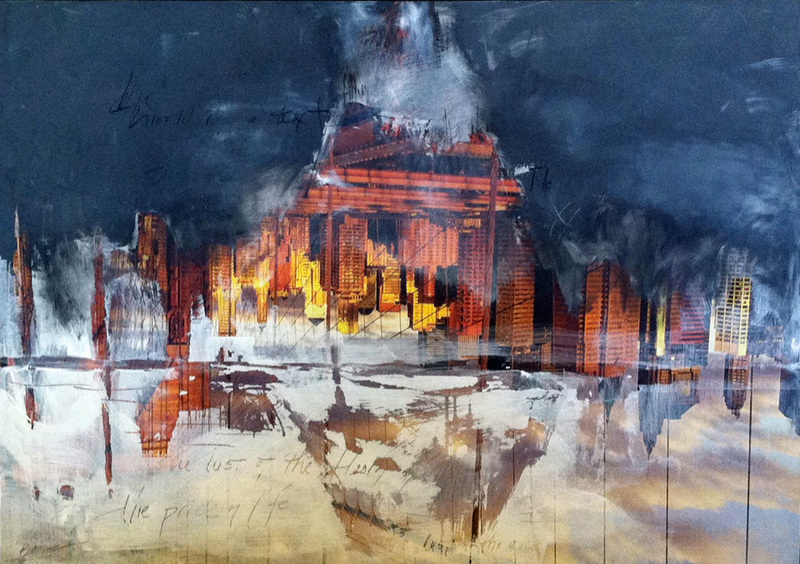 New York City – Brooklyn Bridge /Global City Babel 54″ x 32″ oil and wax on archival Ikea photograph. Heaven and earth will pass away but my words will not pass away (Matthew 24:35), Josh Garrels sings in Words Remain. 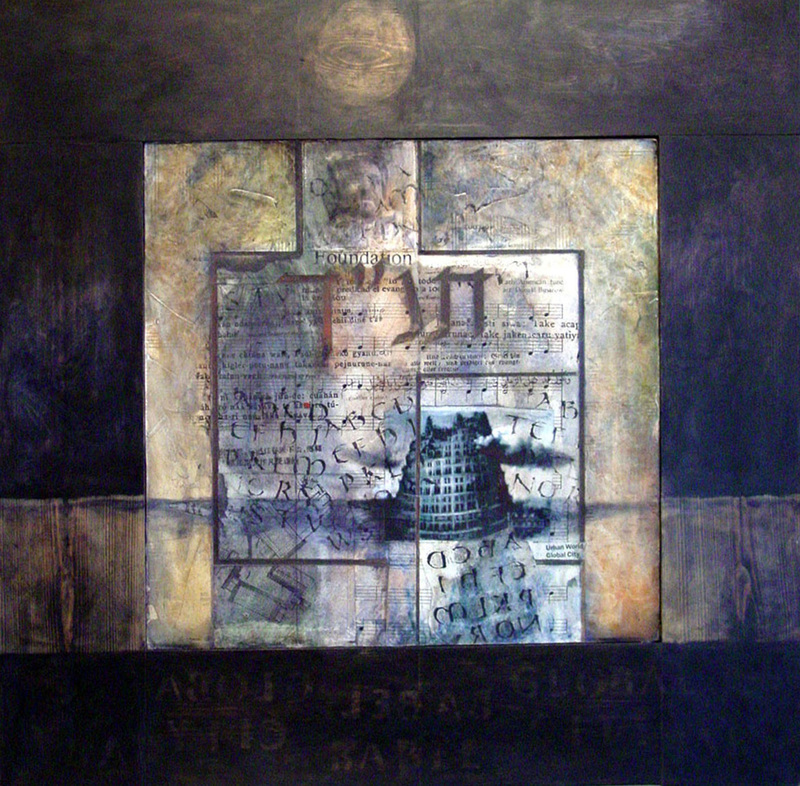 This entry was posted in Collections and Series of Work, Shows and Galleries and tagged Babel, Babylon, Bruegel's Tower of Babel, enmity, Henrik Kerstens, judgment, Saint Augustine's City of God, The Antithesis, The Babe of Bethlehem, The City of God, The City of Man, The Harlot, the seed of the woman, The Tower of Babel, the Word of God. Bookmark the permalink.